Sometimes the scene is just visually stunning, especially with a little flash of angled late afternoon sun on that bright red Virginia Creeper. Love the peeling paint, the weathered wood, cloudy windows and the door hinge. Yet the plant flashes its brilliance before it fades, while the building simply fades. This is from several years ago, but each October, on a day as warm as summer, I remember this moment and share it again. If you’d like a print of this photo on various materials—canvas, metal, acrylic, and more—it is available in my photography collection in my Fine Art America gallery entitled, simply, “Red”. For photos of lots of black cats and other cats—and even some birds as I first published this post there—visit The Creative Cat. This entry was posted on October 17, 2014 by Bernadette. 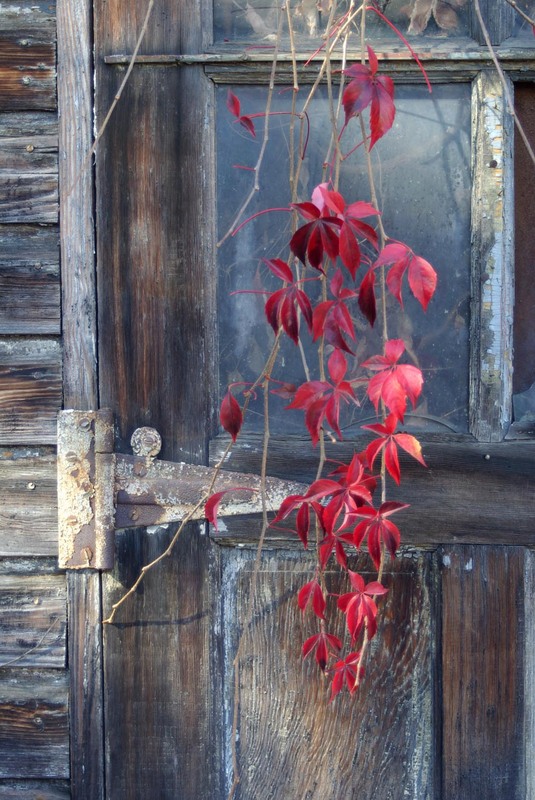 It was filed under autumn, neighborhood, wildflower and was tagged with antique, autumn, outdoor photography, peeling garage door, photography, virginia creeper.